I chose this image from the Ellora archaeological site, a series of 34 rock-cut temples, because I think that even more remarkable then the incredible feats of architecture and engineering, it that three religions have managed to worship here in harmony since around the 6th century. 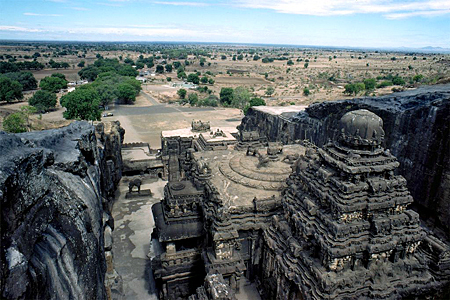 This image is of Cave 16, the Kailasanatha Temple, a multi-storied temple complex, carved out of a single piece of rock, which covers an area twice the size of Parthenon. The temple was designed to recall Mount Kailash, the abode of the Hindu deity Shiva, but it is also sacred to Buddhists and Jainists. 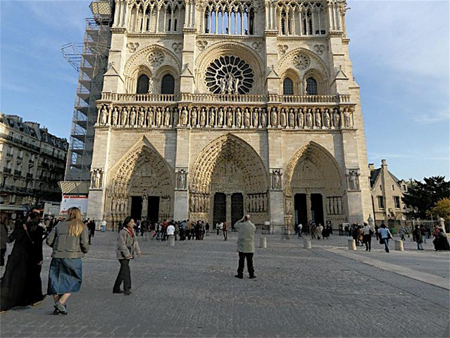 There are many compelling QTVRs in the Digital Library, but this exterior view of the western façade of Notre Dame is my sentimental favorite for its ability to transport me into an immediate feeling of unity and harmony. While based in Paris for a couple of weeks of research a few years ago, when I had a tendency for being too often skint, hungry and love tired, I would sit in front of this façade for hours quietly moved by the cathedral’s beauty and comforted by the activity surrounding it. Look up at the flying buttresses and down at the discarded cigarette butts at your feet. Study the rose window and portals as well as the man framing his photo of them. Take in the gallery of kings in the dimming light of an autumn day. The spirit in all of its extravagant holiness and sweet mundanity. No one photographs signs like Walker Evans. The creek painted on the billboard is a playful trompe l’oeil that initially distracts from the photograph’s latent poignancy. 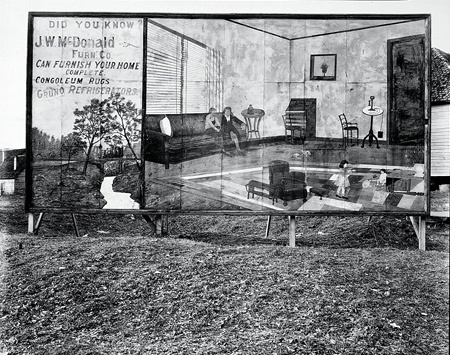 Taken during the Great Depression, the enormous, well furnished (if awkwardly rendered) living room on the billboard contains luxuries few could afford. Moreover, the billboard blocks the houses in the background – the dream home supersedes reality. Many of Evans’s photographs document a United States ravaged by the Depression with a complexity his subjects deserve but the subtlety and formal sophistication of this picture is striking. A little girl stands outside in front of a closed door. She clutches her coat and stares directly forward. 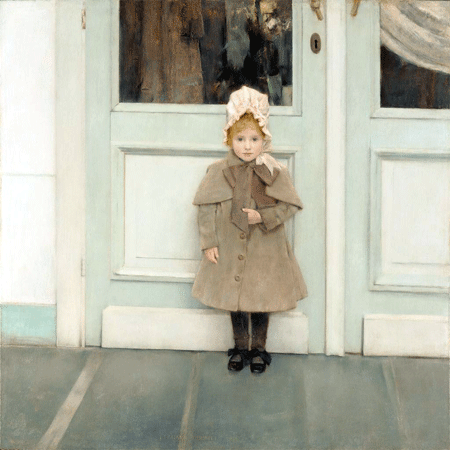 Cool Northern light permeates this little portrait by Fernand Khnopff, a leading artist of the Belgian branch of late nineteenth-century Symbolism. Jeanne hesitates as she presses against the door, looking out at the world quietly, thoughtfully. I chose this painting because I like the inherent metaphor for the pause between childhood and adulthood, and the resistance between the two. I have always had a fascination with advertising before the world of graphic arts relied heavily on digital technology. Art Nouveau brought out the best creations in poster design. The grand use of thick outlines, vibrant colors, and use of unique typography allowed people to see these posters from miles away and be drawn into the artwork and message. You can see some of these trends even today. This artist, Henri Meunier, created great works throughout his career that are bold and have a personality all their own. Gentile da Fabriano, St. Nicholas Saves a Ship from Sinking; predella panel from the Quaratesi Altarpiece, 1425. Image and original data provided by SCALA, Florence/ART RESOURCE, N.Y. http://www.artres.com http://www.scalarchives.com . (c) 2006, SCALA, Florence / ART RESOURCE, N.Y. While there is much to love in this very strange painting – how the storm clouds darken the skies and sea on the right, the limpid green water, the concise depiction of details such as the rope ladders – my favorite part is the pale mermaid on the lower left. The figure is delicately painted, and every scale is clearly delineated. Is she the reason the boat is in dire straits? Or is she just another creature of the sea, along with the fishes and the starfish that share the bottom of the composition? Is she escaping St. Nicholas (she turns her face towards him as she swims away), or is she just surprised by his arrival? And doesn’t he look like a superhero in his red cape and gloves? Detail of Gentile da Fabriano, St. Nicholas Saves a Ship from Sinking; predella panel from the Quaratesi Altarpiece, 1425. Image and original data provided by SCALA, Florence/ART RESOURCE, N.Y. http://www.artres.com http://www.scalarchives.com. (c) 2006, SCALA, Florence / ART RESOURCE, N.Y. I love exploring the costumes and accessories found in the ARTstor Digital Library. From umbrellas to hats, evening gowns to shoes, there is so much to look at! Sometimes it’s the colors or the design that catch my attention, but for this dress it’s the texture. I can’t get over all these feathers. Lucy Sawyer, Communications Specialist. Félix Vallotton,The Spring, 1897 | Petit Palais (Geneva, Switzerland) | Image and original data provided by Erich Lessing Culture and Fine Arts Archives/ART RESOURCE, N.Y. I like it because it is for the spring and I WANT the spring! This photo captures a rebellious spirit, an insouciance, and a sharpness that entranced so many about this controversial figure. As a portrait, I think it successfully conveys the so-called “inner workings of the mind” and makes the image itself magnetic and powerful. In terms of the ARTstor Digital Library, it’s exciting that we can help to preserve and share these iconic images which have resonance in so many disciplines—politics, world history, photography, art history, military history, Latin American Studies, popular culture, etc.